After last week’s surprise sweep by the HAAR DISCIPLES over the BUCHBINDER LEGIONAERE it was clear that the ATHLETICS need to win at least one of the two make-up games against the HEIDEKOEPFE to advance to the postseason. In game one HEIDENHEIM built up a fast 3-0 lead en route to a 7-2 win. Markus Winkler picked up the win, his 50th for the HEIDEKOEPFE in his Bundesliga career. The season for MAINZ came down to the second match of the doubleheader and the guests once again took a lead on a sac fly by Peter Dankerl in the eighth. But the A’s had one rally left. Prospect Kevin Kotowski became hero, when he delivered the decisive two-run walk-off double in the bottom of the ninth for a 3-2 win and place fourth in the south. The CAPITALS and the UNTOUCHABLES met for a make-up game of an earlier rainout on Sunday to conclude the regular season schedule in Germany. 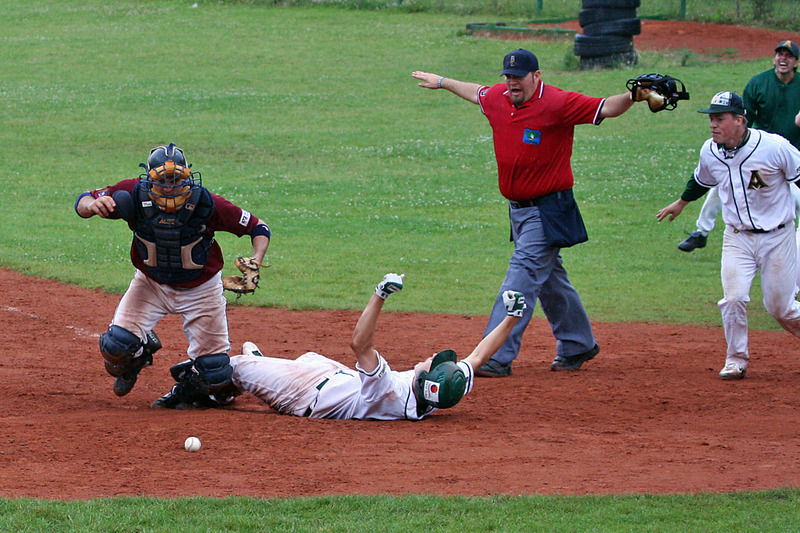 PADERBORN scored two runs in the eighth in a 6-3 win on the field. However they had three foreign players in the lineup at the end of the match and will most likely lose the game 0-9 due to a federation ruling.